On April 22, 2015, Katherine Hayhoe declared that permanent drought was the future for the Texas Panhandle and that part of the nation’s beef supply would get increasingly strained. All the talk was about Texas having entered a state of permadrought with no relief in sight. Now let’s fast-forward ahead 3 years to 2018. 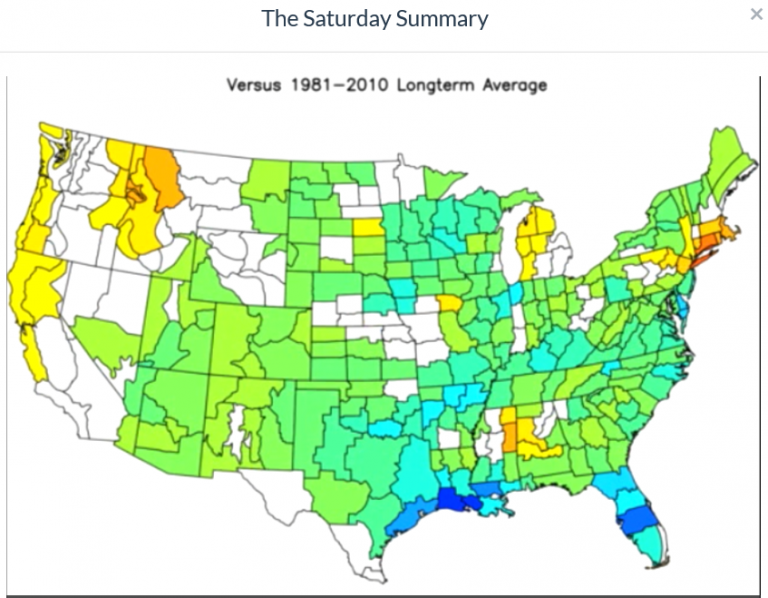 In his latest Weatherbell Satuday Summary, meteorologist Joe Bastardi brought up the once highly ballyhooed Texas megadrought, reminding us at the 2:15 mark how back in 2012 “prominent Texas climatologists” were claiming that the 3-year heat and drought had been part of climate change. Since those doomsday proclamations were made by the climate experts, Bastardi shows how the dire predictions never cam to pass, and that the droughts have happened before in the 1950s, and were part of the natural Texas weather. Joe Bastardi: “Does that look like a drought to you?” Source: WeatherBell.com, Saturday Summary, July 21, 2018. Yesterday I wrote about all the spectacular failed Arctic ice predictions made some 10 years ago. In real private industry where results actually count, such people would have been booted out long ago. They’re just like the “end of the world” mob. Did you mean this one, Newminster? I get the same one on both links! I do now too, but the first time I clicked on the one you posted I got the Monty Python cheese shop sketch (it’s the only Monty Python in my history file for the last 7 days, and I didn’t look it up myself). Never had that happen before. Weird! Anyway, thanks for putting me onto that bit. It’s so VERY appropriate to the global warming scare, ….fits it like a glove. Katherine Hayhoe uses and investigates Global Climate Models a lot [link HERE]. And as an evangelical Christian she preaches her version of this modelled world she has explained here. It’s a heady mix of belief in the models mixed with biblical references, clerical preaching, and a little (misconstrued) evidence. No wonder she is wrong about the weather. But utter belief is all these cAGW types have, so is is to be expected that they will go off prematurely with little evidence and much certainty. I wonder when, or if, she’ll ever repent for bowing before the false (modelled) gods of Gaia. I bet SebastianH, can’t resist a comment about this as he has undertaken to be my troll! It is not climate science it is political engineering. Note the white area in central Washington State! We haven’t seen a Polar Bear or a Penguin in ages. What we do have is human activity that causes, sometimes deliberately, fires in the dry grass along major roads. Most recent was a pickup truck that caught fire — so the driver pulled over into the grass at the edge. We’ve lost count of these. Hayhoe isn’t alone. Heidi Cullen is another pea in the loopy climate “scientist” pod.